he Greater Newport area is located in the South Eastern part of Pend Oreille County, in Washington state, and spills over into Bonner County, in North Eastern Idaho. Pend Oreile County is the most North Eastern county in Washington state, where the North-flowing Pend Oreille River links the communities of Newport, Usk, Cusick, Ione, Metaline & Metaline Falls. The closest commercial airport is Spokane International Airport (GEG), which is about an hour fifteen minute drive from Newport, WA. Newport, Washington, the largest City in Pend Oreille County (population approximately 2200), is located about an hour north east of Spokane, Washington along US Highway 2-E (otherwise known as Newport Highway). Get onto Division Street heading Northeast and then continue to follow Highway 2-E towards Newport and you can't miss us. But don't just focus on your GPS, instead your eyes peeled for what our area has to offer you beyond the gorgeous trees, lakes, rivers and wildlife. Newport, Washington is located about an hour north west of Coeur d'Alene, Idaho and makes for a perfect day trip. 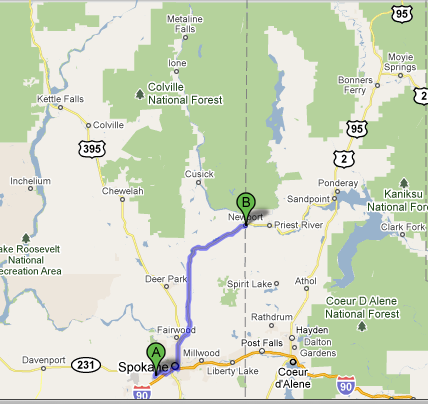 As you leave Coeur D'Alene heading north on 4th Street, continue onto I-90W towards Post Falls, Idaho and Spokane, WA. 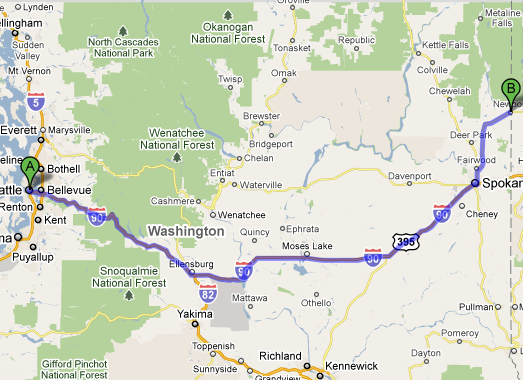 Then take Exit 7 off onto ID Highway 41 heading north towards Rathdrum and Spirit Lake, ID. 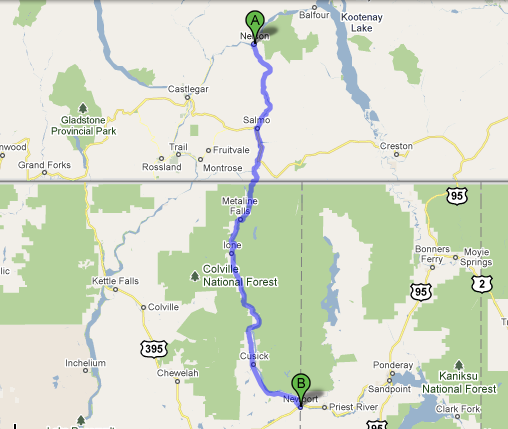 You will go through Oldtown, ID then will hit Hwy 2 (also Walnut Ave). Turn left and you've made it to Newport, WA. There are a couple of ways to get to the Greater Newport area from Canada. If you are coming down the west coast, your best bet is to get to Seattle and go from there. Directions on getting here from Seattle are desribed in a different section below. If, instead, you are already inland and are coming down from say Nelson, British Columbia (or Castlegar, or Grand Forks), you'll want to get onto Nelson Nelway Hwy/BC-6 S and follow it South over the Creston/Nelway Border Crossing and then follow WA 31 until it becomes WA Hwy 20-E. 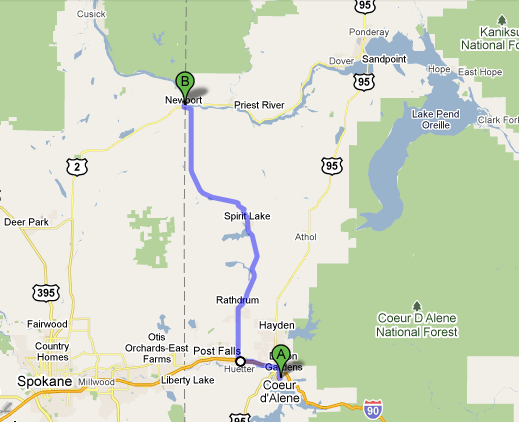 Follow WA Hwy 20-E through Metaline, Ione, Usk and Cusick until you hit Newport. Nelson to Newport is about a 2 1/2 hr drive. If you're planning on crossing the border late at night, be sure to check their hours of operation as they are generally only open daytime hours (8am - midnight). 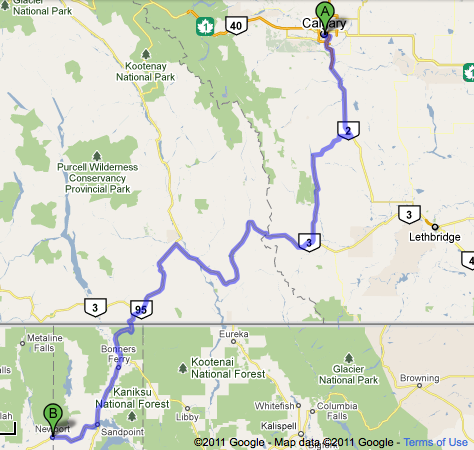 If instead you're coming from further East (Eastern British Columbia (Creston or Cranbrook) or Alberta (Calgary or Lethbridge)), you'd want to follow the Crowsnest Hwy West / AB Hwy 3 W or BC Hwy 95 S across the Kingsgate Border Crossing, down US Hwy 95S through Bonner's Ferry then turning right onto US Hwy 2 W in Sandpoint, ID. You then follow US Hwy 2 W through Priest River into Oldtown then you've arrived in Newport, Washington. Newport, WA is about a 5 hour drive from Seattle. You simply follow I-90 E, passing through Ellensburg and Moses Lake en route to Spokane. Once you hit Spokane, follow the simple directions for how to get here from Spokane, described above.